From the ancient Book of the Dead to Dante's Divine Comedy, the living have attempted to describe the world of the dead. Tours of Hell focuses on one form of that attempt: the tours of hell found in Jewish and Christian apocalypses of late antiquity and the early Middle Ages. Himmelfarb examines seventeen texts, preserved in five languages and spanning a thousand years of human history. These include Hebrew texts and Christian texts in Greek, Latin, Ethiopic, and Coptic, such as the Apocalypse of Peter and the Apocalypse of Paul family. Muslim texts, medieval visions, and other related literatures are also discussed. Himmelfarb details the common elements of the tour tradition, including such features as a hero or heroine figure, a heavenly revealer, and descriptions of the punishments awaiting those who arrive in hell. She convincingly refutes the accepted nineteenth-century critical view of the earliest of these tours, the Apocalypse of Peter, as a Christian form of an "Orphic-Pythagorean" descent to Hades. She place the work instead on the family tree of the tour apocalypse, a genre she traces back to the third century B.C.E. Book of the Watchers (1 Enoch 1-36). 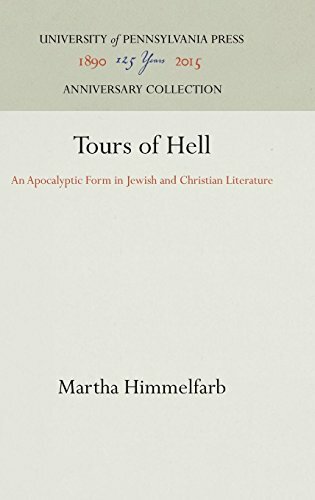 Linking the Apocalypse of Peter with later Jewish tours of hell, Himmelfarb reveals significant sin-and-punishment combinations that seem to point to a common source, which she theorizes to be a lost Jewish Tour work of the late Second Temple period. Rich and fascinating texts seldom before brought to light are treated in detail in this pioneering study. A comprehensive work on the apocalyptic tradition, Tours of Hell will be of great interest to scholars and students of religion, history, ancient and medieval literature, and Dante studies.